Renate from Norway was my Autumn Crochetville Secret Pal. I received a wonderful reveal package from her yesterday. 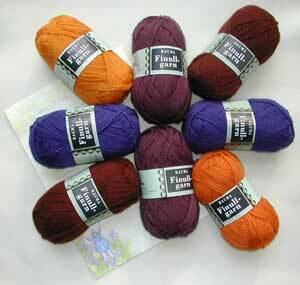 She sent eight skeins of pure wool, Rauma Finullgarn–two orange, two plum, two brown, and two bluish-purple. It’s fabulous and I love it. Thank you, Renate! I’m excited that I already have an idea of what I’d like to make with it, but I will need to experiment. This weekend we spent some time at my brother-in-law’s house. With four dogs (plus ours makes five), four adults, and two little kiddos running around, things can get crazy! But I found some quiet time to crochet, and I spent it wisely by working on one of my three projects for the book. 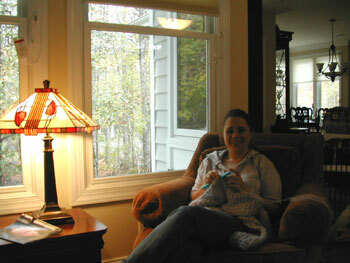 It’s now Sunday evening and I’ve finished the project I was working on in this photo. It was a joy to crochet and is by far my favorite of all of the three patterns I submitted. Speaking of which, thank you to everyone for your congratulations and well wishes! Many of you asked for the name of the book and wanted to know how I got into designing. I don’t yet know the name. I imagine that gets hashed around quite a bit before everything is finalized and ready for publication. Getting my foot in the door was a matter of being in the right place at the right time with the right stuff. The editor of the book saw my first published design, Alternating Windowpanes Scarf, at Crochet me. He liked it and contacted me to ask if I would be interested in submitting patterns for a crochet book they were planning for 2005. I’m thrilled about having this opportunity and thankful to Kim of Crochet me for making the place that I could be in at the right time to make it all happen. Hey Donna. Squinting doesn’t help! I can’t figure out what it is, but I’m happy to wait. Think more design is in your future? I am completely jealous! Such beautiful yarn! :) I’m anxiously awaiting this book! I meant to offer my congrats for being asked to contribute to the book. Just looked at the scarf pattern too, which I must have missed before. It’s very nice! Oh wow! You know I’m jealous now, right? Beautiful colors, I would have been doing the happy dance if I were you! ooohhhh….lovely “quiet spot”. Looks like a great view out that window too. Do I spy a “Q” hook working on that -er-um- whatever it is?